This is the maximum volume of foreign tourist flow recorded in the region over the past 10 years. It is reported by "Vesti: Primorye" with reference to the press service of the regional administration. The main growth was recorded in the direction from the Republic of Korea. From January to December last year, more than 220 thousand travelers visited Primorye. This is 120% more than in the previous year. It is worth noting that the unprecedented growth of interest of South Korean tourists to the region has been observed for the third year in a row. According to the Director of the Department of tourism Konstantin Shestakov, this is facilitated by active and diverse work in the South Korean market. The tourist potential of the region was presented at the thematic international Asian exhibitions, several tours for tour operators and representatives of airlines from the Republic of Korea were held. Airlines that entered the seaside market have made a significant contribution to the promotion of the Primorye region in Korea. A special place in this work is the interaction with bloggers and youth pop groups of the Republic of Korea. The region has already become a real stage for them – there are several clips that have gained millions of views on the Internet. Positive dynamics is observed in the Japanese direction. For 12 months of last year, the region received more than 20 thousand guests from the land of the rising sun. The increase was 15%. The most numerous is still the tourist flow from the people's Republic of China. Last year, about 422 thousand people from this country entered the region, 365.5 thousand of them – for tourist purposes. The indicator remained at the level of last year. It should be noted that the number of German citizens who visited Primorye has increased several times. From January to December, the region was visited by almost 900 tourists from this state. This is 200% more than in the same period of the previous year. 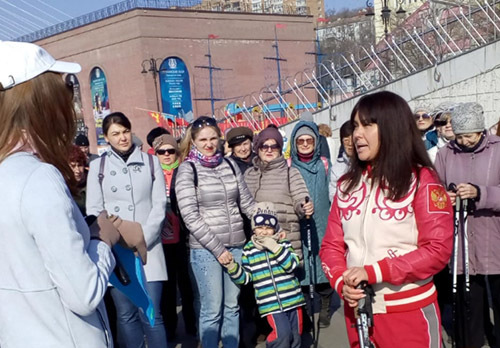 Also, the region received 40% more Australian citizens: during 2018, almost a thousand people from this country met with Primorye, in 2017 – almost 700. The industry faces an ambitious task-to bring the volume of annual tourist flow to the region to 10 million people by 2022.